NEW YORK--(BUSINESS WIRE)--MoviePass™, the nation's premier movie-theater subscription service and a majority-owned subsidiary of Helios and Matheson Analytics Inc. (NASDAQ: HMNY), and Fandor®, the streaming service with the largest collection of independent films, documentaries, international features and shorts, today announced that both companies are partnering with Costco to offer a one-year subscription plan for a flat fee of $89.99. The package deal for both services is available exclusively to Costco members and covers a year of membership for both MoviePass and Fandor. The offer will only be available online at Costco.com for one week, from December 12 to December 18, 2017. Those who sign up for the one-year subscriptions will receive digital codes providing instant access to Fandor’s library of over 5,000 films, as well as a year’s worth of the latest and greatest in-theater experiences through MoviePass. The annual subscription for both services is offered exclusively through Costco.com and will be billed as a one-time payment of $89.99 at the time of purchase. MoviePass introduced its $9.95 per month subscription plan in August 2017, as part of a majority acquisition of MoviePass by Helios and Matheson Analytics Inc. (Nasdaq: HMNY) (“HMNY”). Since the roll out of the $9.95 per month plan, MoviePass’ subscriber base has grown to over 600,000 subscribers, delivering on its promise to bring back the joy of the theater-going experience while increasing movie theater attendance across the country. Costco members who purchase the combined deal will receive digital codes that can be used to gain access to each annual subscription. 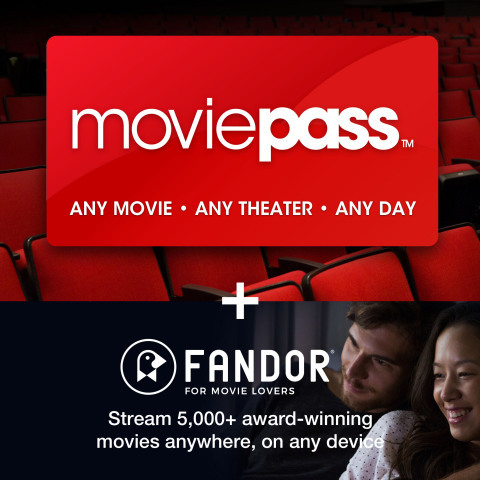 Members will need to enter each code on the respective MoviePass and Fandor websites in order to complete the sign-up process. MoviePass, Inc. is a technology company dedicated to enhancing the exploration of cinema. As the nation's premier movie-theater subscription service, MoviePass provides film enthusiasts the ability to attend unlimited movies. The service, now accepted at more than 91% of theaters across the United States, is the nation's largest theater network. For more information, visit www.moviepass.com. Fandor streams over 5,000 handpicked, award-winning movies from around the world. With over 500 genres that include Hollywood classics, undiscovered gems, and the latest festival favorites, Fandor provides curated entertainment and original editorial content on desktop, iOS, Android, Roku, Apple TV, Chromecast, Amazon Prime, Sling TV, CenturyLink Stream, and throughout social media. With a rapidly expanding library and innovative partnerships, Fandor’s goal is to captivate and inspire a global community of movie lovers. Certain information in this communication contains “forward-looking statements” about HMNY and MoviePass within the meaning of the Private Securities Litigation Reform Act of 1995 or under Section 27A of the Securities Act of 1933, as amended, and Section 21E of the Securities Exchange Act of 1934, as amended (collectively, “forward-looking statements”), that may not be based on historical fact, but instead relate to future events. Forward-looking statements are generally identified by words such as “projects,” “may,” “will,” “could,” “would,” “should,” “believes,” “expects,” “anticipates,” “estimates,” “intends,” “plans,” “potential” or similar expressions. Such forward-looking statements include, without limitation, statements regarding MoviePass’ business and prospects (including the benefits of the arrangement with Fandor and Costco described herein). Statements regarding future events are based on the parties’ current expectations and are necessarily subject to associated risks. Therefore, actual results may differ materially and adversely from those expressed in any forward-looking statements. Such forward-looking statements are based on a number of assumptions. Although management of HMNY and MoviePass believe that the assumptions made and expectations represented by such statements are reasonable, there can be no assurance that a forward-looking statement contained herein will prove to be accurate. Actual results and developments may differ materially and adversely from those expressed or implied by the forward-looking statements contained herein and even if such actual results and developments are realized or substantially realized, there can be no assurance that they will have the expected consequences or effects. Risk factors and other material information concerning HMNY and MoviePass are described in HMNY’s Quarterly Report on Form 10-Q filed with the SEC on November 14, 2017, in HMNY’s Annual Report on Form 10-K for the fiscal year ended December 31, 2016, in HMNY’s Current Report on Form 8-K filed on November 30, 2017 and other HMNY filings, including subsequent current and periodic reports, information statements and registration statements filed with the SEC. You are cautioned to review such reports and other filings at www.sec.gov. Given these risks, uncertainties and factors, you are cautioned not to place undue reliance on such forward-looking statements and information, which are qualified in their entirety by this cautionary statement. All forward-looking statements and information made herein are based on HMNY’s and MoviePass’ current expectations and HMNY does not undertake an obligation to revise or update such forward-looking statements and information to reflect subsequent events or circumstances, except as required by law. In particular, MoviePass’ limited time subscription pricing models (such as described herein) are new. There can be no assurance that a resulting rate of increase in its subscribers from these pricing models will occur, will continue or will be sustained. Moreover, an increase in the number of MoviePass subscribers provides no assurance that the MoviePass business model will lead to profitability.